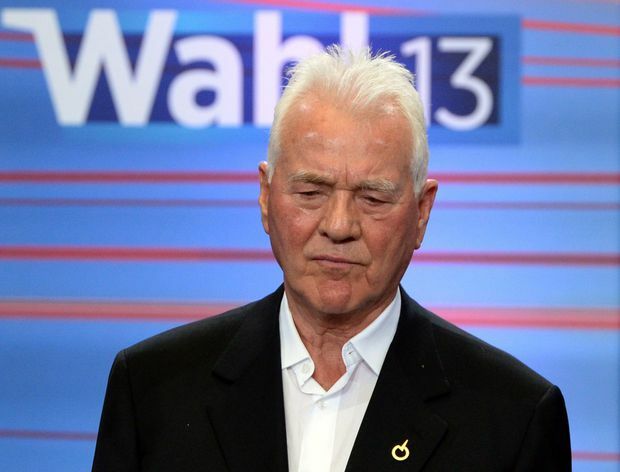 Austro-Canadian billionaire Frank Stronach waits for the start of a TV debate after national elections in Vienna, Austria, Sept. 29, 2013. Industrialist Frank Stronach is alleged to have lost $800-million on several misguided investments, a track record that daughter Belinda Stronach says should prevent the 86-year-old from taking back control of the businesses he built over a lifetime. In the latest salvos of a two-year battle for control of their family fortune, which totalled $1.6-billion eight years ago, Ms. Stronach alleged in a court filing Monday that the founder of auto-parts company Magna International Inc. has lost his entrepreneurial touch. She said that since cutting ties with Magna in 2011 and selling his stake in the business, her father has bankrolled a series of money-losing ventures, including an organic cattle ranch, electric bicycles, a pumpkin seed oil business and a Florida golf course. The investments total US$846-million, and include US$55-million for two massive bronze and steel sculptures of the winged horse Pegasus, one of which is at the Stronach’s Florida racetrack, and a second that’s still in storage in China. The court filings come in response to a lawsuit launched last October by Mr. Stronach and his wife, Elfriede, against their daughter, her two adult children and her perceived ally, former Stronach Group CEO Alon Ossip. The couple accused their daughter of mismanaging the family’s affairs and spending lavishly on herself. They asked the Ontario Superior Court for $520-million in damages and demanded she return control of the family’s businesses to Mr. Stronach, who cut all ties with the business in 2011 when he jumped into politics in Austria. Andrew Stronach, the couple’s only other child, subsequently filed a lawsuit supporting his parents' position. None of the allegations has been heard in court. Lawyers for Mr. Stronach declined to comment, but referred questions to family friend Dennis Mills. In returning fire, the 52-year-old Ms. Stronach is asking the court to leave her in charge of The Stronach Group, which owns six U.S. horse-racing tracks, gambling and media businesses based on thoroughbred racing and real estate. She said the racetracks have doubled their revenues to US$1.1-billion on her watch, in part by embracing online betting. Ms. Stronach is also countersuing her father for $32.8-million, claiming he should repay money spent on his Austrian political campaign. The central legal issue in this dispute is expected to be agreements signed in 2011, when Mr. Stronach handed his daughter full control of the family’s affairs, lawyers for both sides say. Mr. Stronach alleges he signed documents at the time that allowed him to regain control of the family companies whenever he desired. His daughter says the agreements were drawn up by Mr. Ossip, as CEO of the family company, at her request when she was dealing with cancer, were never dated, and were only meant as emergency backstops to ensure the family kept control of its businesses if she was incapacitated. The Stronach family feud began behind closed doors two years ago, when Ms. Stronach and Mr. Ossip began turning down requests for cash to support projects such as a 90,000-acre ranch in Florida that raises grass-fed cattle. Until that point, Frank and Belinda Stronach were in close contact, with their business and personal interests intertwined. Prior to her father’s initial lawsuit last October, Ms. Stronach tried to resolve the dispute by splitting up the family’s holdings: Her father would hold on to the cattle-ranching operations, she would take the horse-racing and gambling businesses, according to advisers working with both groups. Mr. Stronach turned down the idea of dividing the empire because Magna’s founder believes he has created the family’s wealth and should have ultimate authority over where it is spent. Legal documents also show that Mr. Stronach wants to use the cash generated from horse racing, an estimated US$80-million annually, and the ability to borrow against his racetracks and other real estate assets to finance his organic farming operations, which are currently losing money.